Join the discussion on our forums! Come discuss Hench-Clan Burglar over in our dedicated Hench-Clan Burglar discussion topic. This card is really useful in the mirror match, Pirate draw for raiding party, its so good. One of the most annoying play sounds in the history of hearthstone. Absolutely despise it. Otherwise, great card. Blink Fox power level or close. I think it's actually a lot better, even with subpar stats. You can get the card of your choice which can be AOE or some other form of stall or heal that Rogue severely needs. 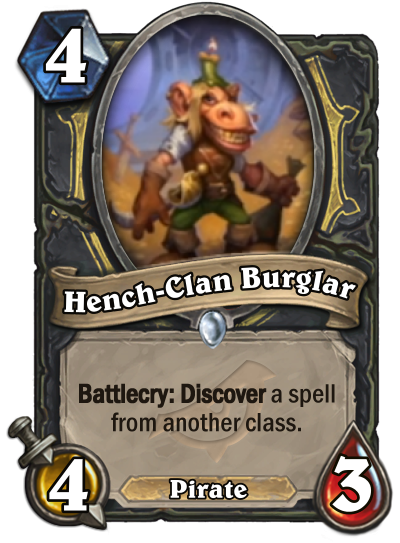 Along with that, it activates Vendetta and Underbelly Fence when playing against another Rogue (including the mirror tempo or thief Rogue matchups), which matters a lot when the meta is filled with Rogues. Also, the Pirate tribal tag goes a long way with Raiding Party in Standard. Potential source of AoE for rogues what justifies 4/3 4 mana. It is also a pirate what makes grat combo with Spectral Cutlass and Raiding Party. Very good card. It's not even close to Fal'dorei Strider or Tomb Pillager , first impression of this card why u do this and not add a good 4 drop for a different archetypes? main word different . In first days i will try Violet Teacher and not this. I think in my previous sentence enough explanations why I wouldn’t like to make a pre-order. Sounds too arrogantly, but i just want to explain my feelings. I woud agree it's too imperial expect to have one of the strongest 4 dropes in the game in the most of the Rogue dekcs for the years, but this class need it as air. Very good in almost any rogue.